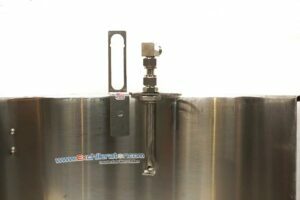 We are very proud to announce the release of our new fully adjustable sparge arm! While the D and Straight sparge arms were great products, they were developed (as most sparge arms are) with small spray ports that can plug with grain bits during re-circulation. Our original intention was to give brewers an easy to use sparge arm that was also easy to clean with a brush to rinse and remove the grains when necessary. While the removable end caps accomplished this and our customers loved them, we really wanted to find a more elegant solution. As you probably already know, we are always looking for ways to improve our products! The idea behind our new sparge arm began with its single large port and lip design. This simple yet elegant design produces a beautiful, gentle spray pattern that gently rinses your mash without the annoyance of grain bits plugging the flow during re-circulation. The ½” stainless port will allow any grain or adjunct up to 5/16 of an inch in diameter to effortlessly pass right through. The spray pattern has a nice tulip petal shape that can be adjusted (size and volume) with a flow control valve installed on the top fitting. The unit comes in 2 lengths ( 8” or 12” ) which gives you the ability to adjust your spray height in most kettles, mash tuns, and coolers. Our friction fit Delrin compression fit ferrules allow you to slide the shaft up and down and even 360 degrees when mounted on The Hangover. This lets you keep the water spraying in any direction, above the grain bed, or even penetrate down into the mash, the choice is yours! Cleaning the unit is also a breeze, flush with warm water, or disassemble and soak in your choice of brewery cleaner! The Silver Spray sparge arm was specifically designed to mount securely on the deck plate of The Hangover. This allows you to mount the sparge arm on just about any mash vessel available due to the wide range of compatible vessels with The Hangover system! If you already have a re-circulation port and would like to incorporate this unit into your brewery, you can either cut the shaft to length you need or contact us to have a custom size made just for you. Stay Exchilerated and keep making great beer! This entry was posted on Monday, April 15th, 2019 at 4:40 pm	and is filed under Products. You can follow any responses to this entry through the RSS 2.0 feed. You can leave a response, or trackback from your own site.